Material is soft cow genuine leather messenger bags with handle,High quality leather, Dimension:15*10.62*2.7 inches (38 x 27 x 7 cm). Outstandingly popular retro shoulder bag with adjustable and detachable shoulder strap,This bag is stylish and classic looking.It is convenient and practical,You will be able to use this bag for many years to come. 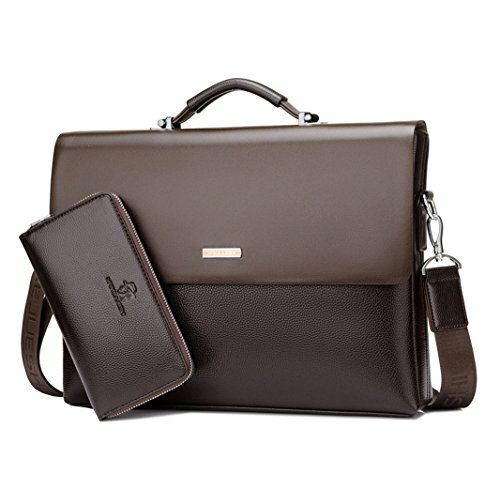 On the back of design brief and easy,the size of the package body is suitable for daily needs,directness with random,reveal the attitude towards life,exquisite workmanship,a man's taste,emanates self-confidence,fluent and concise line,generous and contracted style ,this is the fashion. Multi-functional,Whether it's for work, school, travel or business this satchel will fit the bill.Take this bag to work and or school to use for your notebooks, magazines, books, folders, cell phone, wallet, etc. If you have any questions about this product by Mioy, contact us by completing and submitting the form below. If you are looking for a specif part number, please include it with your message.